Metal desk lamps not only provide lighting for your home, but they're also timeless home accents that can easily be refurbished to fit a room's decor. They provide just ​the right amount of lighting without brightening the whole room. 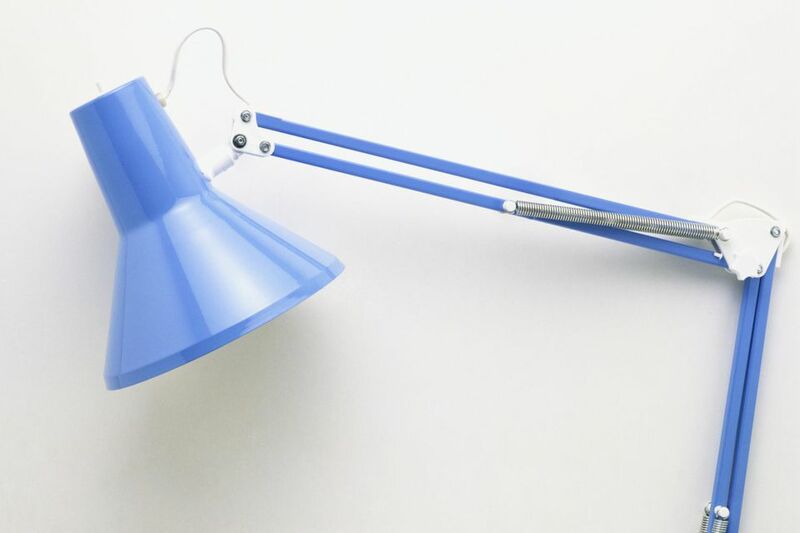 If you have an old metal desk lamp that needs updating or you've picked up a used one that has a bit of wear and tear, refurbish your lamp with a new coat of paint. Pick a bright and vibrant color to make your lamp an accent piece to a room or pick a neutral color to blend in with any existing decor. Before you paint the lamp, wipe off the surface with a rag to remove any dust. Don't use a dusting polish or oil since they can cause the paint not to stick properly. If there is any sticky residue or a heavy coat of dust on the lamp's surface, dampen the rag with a gentle cleanser and water and wipe the area until it is clean. Re-wipe with a dry rag or paper towel to remove the cleanser and water. Make sure the lamp is completely dry before continuing with the refurbishing process. After you've cleaned the lamp, tape off any sections you don't want to be painted. This should include the electrical outlet and any other electrical components, such as the light socket or switch. Use newspaper to cover larger areas and use painter's tape to tape down the newspaper. Take your lamp outside or to another well-ventilated area, such as a patio or garage with the garage door open. Lay down newspaper or a drop cloth to protect any flooring or other surfaces. Place the lamp in an upright position and begin applying the primer/paint spray. Apply the primer/paint in thin, light coats. This may take some time, but it will give you a smoother finish and prevent the paint from running or bubbling. Tip: Wait 15-30 minutes between each coat to speed up the overall drying process and to help further prevent the paint from running or bubbling. Let the paint completely dry. This can take overnight or longer. For best results, carefully bring the lamp indoors or in an area protected from the outside elements. If the paint is still sticky or tacky the next day, let the lamp dry for an additional day. After the lamp is completely dry, gently remove any newspaper and painter's tape. Make sure there is no wet paint or pieces of painter's tape in any of the electrical components or on the socket. Always use caution and be careful when working with electric items. Screw in a light bulb and check to make sure the lamp works correctly. Then, place the lamp in a room of your choice to add additional lighting.